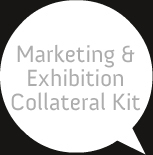 Marketing Collateral : Kit Marketing Collateral Kits play a vital role in creating a common “voice” for all your corporate and marketing communication ensuring standardization and consistency. This kit helps to institutionalize organized and well structured marketing and corporate identity throughout the company. The Kits encompass all the collaterals represent your company to your employees and the outside global market. Through standardized information, these kits always ensure that you retain the brand identity one and the same for all the communication solutions across the company. At an Event you have only a very limited amount of time to capture the attention of visitors. In addition exhibitions allow only a limited amount of space for messages and hence good combinations of the visual and punchy messages are crucial for success. In short it’s really import to carry a bunch of business winning collaterals leaving your powerful presence felt all through the event. We offer a comprehensive range of result-oriented and cost effective event solutions that fulfills your Event objectives. With a clear understanding of your needs and goals, we create the complete exhibition and event solution. The well trained and experienced team of Graphic designers, intelligent writers and creative artists strives together to deliver you unique and innovative event collaterals that meet your event objective. With customized and cutting-edge Event Solutions, we help you to gain higher brand visibility and unmatched business opportunities.